On the Sunday, the world came together to demand climate justice with massive marches of solidarity and positivity. On the Monday, the UN prepared for its global climate summit with more than l00 Heads of State, some there as ornaments, others as advocates for changes in environmental conditions that threaten the survival of many nations and peoples. On the Monday afternoon, U.S. Secretary of State John Kerry called climate change Washington’s number #1 priority. On the Monday night, I was in New York with the visiting President of South Africa marking twenty years of freedom in that country after the overthrow of apartheid. I saw no American officials present. Back home, later that evening, the news was out: the United States was then heavily bombing Syria for the first time with the support of a mélange of Arab dictators and theocracies, using planes we sold them, to make some point about western commitment to freedom. The Jihadists are already vowing retribution, according to SITE, the pro-Israeli “intelligence” propaganda website that is relaying all of their videos, no doubt to frighten us more. How fast we’ve moved from peace to war, from hope to despair. 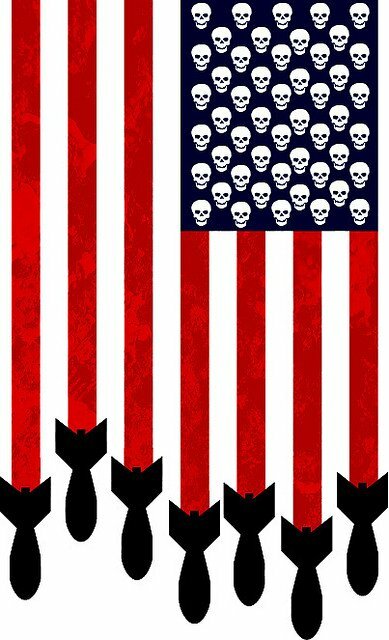 Of course, like so many reports about US military action, there was no mention of civilian casualties or other “collateral damage.” It was assumed by a press that marches in lockstep with the Pentagon that the strikes were surgical, hit their targets and damaged an enemy that earlier in the week released a video almost inviting such a strike, perhaps to show how bad and powerful they claimed to be. As the bombs fell, another video began airing, lacking the overproduction Hollywood glitz for which ISIS has become known, but, instead, offered up a simple stripped down “lecture” by British hostage John Cantlie who says he is a doing it because his government abandoned him and he has no choice. Interestingly, a day earlier, I had an email from the Vietnamese-American filmmaker, Tiana, who is finishing a film on Vietnam’s victorious General Giap who held off the foreign invaders and turned the tide against them. Tiana was asking for my advice on how to present the enormous scale of the body count after the first invasion. There were 500,000 deaths among the French forces, including civilians and the African people they brought to fight for them in a defense of colonialism that the US supported first with money, then, threats of nuclear war and, finally, with over 60,000 American lives. There are analysts who believe that by reacting they way Washington is to ISIS, the U.S. is actually playing into their script and building their prestige. Ultimately, this is a propaganda war, not just a military conflict. It is to influence the direction of the Arab World. We have already seen interviews with ordinary people in Iraq who say that government backed troops there have been more brutal to them than ISIS. They don’t feel like they have many good options. Of course, most Americans stopped paying attention to Iraqi realities years ago, and never realized that we lost the war. Today, as crazy as this must sound to us, ISIS (IS) is posing as liberators, even as they march into the past. For many ordinary Sunni Arabs who have been humiliated by a succession of leaders we imposed, that “heroic” past, may sound better that a worsening present. In some ways, the US bombardment will conjure up bad memories for Iraqis and do what bombing always does: stiffen resistance. The Commander is Chief seems to be glowing as he and his “team” reach into an overused playbook, says Michael Brenner. They may be talking climate change at the UN, but the media world is showing pictures of bombs bursting in air, and changing the global conversation about a planet in peril that the world has been waiting for. We will soon be back in the flag-saluting abyss of paranoia, with predictable results, once the “terries,” as they are known, strike their first blow here. So far, only a deranged vet has penetrated the White House perimeter, but who knows what’s next? Actions produce reactions. Always have; always will. And, yes, sad to report, more Americans will die as things get worse, as they surely will. We have seen this movie before.